The loss of water in the form of vapour from the aerial parts of the plant is referred to as transpiration. Cuticular transpiration takes place through outer covering of the epidermis called cuticle made up of substance called cutin. Lenticels are regions on the bark having loosely arranged cells called complementary cells. Stomata are minute openings on the epidermis of leaves and stems. Most of the water lost by transpiration (about 95%) takes place through the stomata. A stoma is a minute pore on the epidermis of aerial parts of plants through which exchange of gases and transpiration takes place. 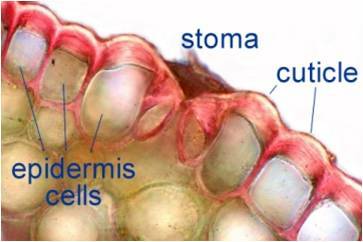 Each stoma in surrounded by a pair of kidney shaped guard cells. Each guard cell is a modified epidermal cell showing a prominent nucleus, cytoplasm and plastids. The wall of the guard cell is differentially thickened. The inner wall of each guard cell facing the stoma is concave and is thick and rigid. The outer wall is convex and is thin and elastic. 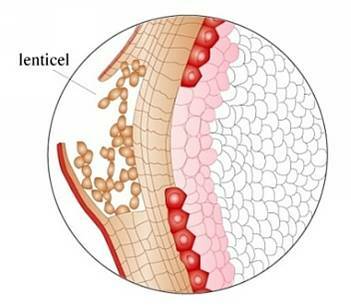 The guard cells are surrounded by a variable number of epidermal cells called subsidiary cells. Opening and closing of stomata takes place due to changes in turgor pressure of guard cells. During the day, water from subsidiary cells enters the guard cells making the guard cells fully turgid. As a result, the thin elastic convex outer walls are bulged out causing the thick and rigid concave inner walls to curve away from each other causing the stoma to open. During night time, water from guard cells enters the subsidiary cells and as a result, the guard cells become flaccid due to decrease in turgor pressure. This causes the inner concave walls to straighten up and the stoma closes. The actual mechanism responsible for entry and exit of water to and from the guard cells has been explained by several theories. Proton-potassium pump theory of Levitt. Starch converted to malic acid. Increased K ions & malate ions increase the OP thus water enters the guard cells and stomata open. Photosynthesis stops, respiration continues, increase CO2 conc. High CO2, K ion transport stops. Abscisic acid is formed, reverses H – K pump. Malate ions produces malic acid with H ions lowering its synthesis by PEP carboxylase. These changes induce reversal of K ions. Guard cells – flaccid – stomata close. Light greatly influences the opening and closing of stomata as it stimulates production of malic acid due to conversion of starch to sugar. Stomata do not open in U-V light and green light but remain opened in the blue and red regions of the spectrum. Stomata open with rise in temperature and close at lower temperature as light and temperature are directly related. But higher temperatures also cause stomatal closure. Accumulation of potassium chloride causes opening of stomata. The increase of organic acid content in the guard cells causes the stomata to open. At low concentrations of CO2, the stomata open. With increase in the concentration of CO2, the stomata begin to close and when CO2 concentration of cells is higher than its concentration in the air, the stomata completely close. Water is responsible for causing changes in the turgor of the guard cells. Guard cells become flaccid on losing water and so the stomata close. Similarly the guardcells become fully turgid on gaining water and the stomata open. Under conditions of water scarcity also, the stomata close. Abscisic acid accumulates in the leaves when the plants experience water stress or water deficit. It has been observed, that ABA (Abscisic acid) stimulates closure of stomata under these conditions. The evaporation of water of mesophyll cells into intercellular space. Concentration gradient development of water vapour in air spaces. Diffusion of water vapours of air spaces into the outer dry atmosphere through stomata. Humidity:Humidity refers to the amount of water vapour present in the atmosphere. If humidity is high, rate of evaporation is low and so the rate of transpiration is slow. Wind: Wind is air in motion which enhances the rate of evaporation. Wind increases the rate of transpiration. But winds at high velocity bring about closure of stomata and thus reduce the transpiration rate. Atmospheric Pressure: Low atmospheric pressure increases the rate of transpiration. Water vapour from transpiring surfaces rapidly moves into the atmosphere which is at low pressure. Temperature :Increase in temperature increases the rate of transpiration as high temperature causes the water in intercellular spaces to vaporize at a faster rate. 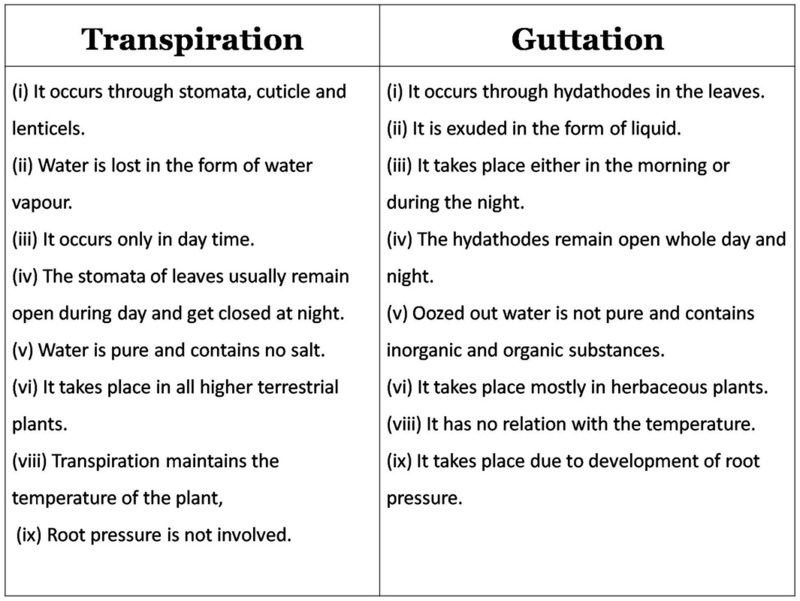 Light: Light influences opening of stomata and so rate of transpiration is high in light and less in darkness. Water: Less amount of soil water decreases the rate of transpiration. If the rate of transpiration exceeds the rate of absorption, the stomata get closed the cells lose their turgidity and the plant wilts. Leaf structure : In xerophytes, the rate of transpiration is reduced due to structural modifications such as less surface area, thick cuticle with hard and leathery surface, leaf rolling, sunken stomata, waxy coating, lower stomatal frequency, hairy covering and development of mechanical tissue. Age of Plants: Germinating seeds generally show a slow rate of transpiration. It increases with age and becomes maximum at maturity. But rate of transpiration decreases during senescence. Anti-transpirants are the chemical substances that are used to reduce the rate of transpiration without causing any adverse effect on their growth and other metabolic activities. These substances are used during dry season to avoid wilting when the rate of transpiration is high. A) Metabolic inhibitors: These are acetyl salicylic acid, phenyl mercuric acetate (PMA) and abscisic acid (ABA) – induce closure of stomata. B) Film forming substances: Dimethyl silicon emulsions, plastic films and wax emulsions spreading on the leaf surface reduce transpiration. Wilting refers to the loss of rigidity of non-woody parts due to more water loss. When the plant losses water more than its own weight, it should be compensated by absorption. If not, then it results in wilting of the plant. Incipient wilting :Wilting symbols are not visible externally though the water content has decreased. Temporary wilting: Incipient wilting is followed by temporary wilting.If the plant regains the turgidity, it will regain its original position and this called incipient wilting. Permanent wilting: Due to less availability of water in soil temporary wilting leads into permanent wilting. Plant dies even after water supply. So if wilting is irreversible it is called permanent wilting.